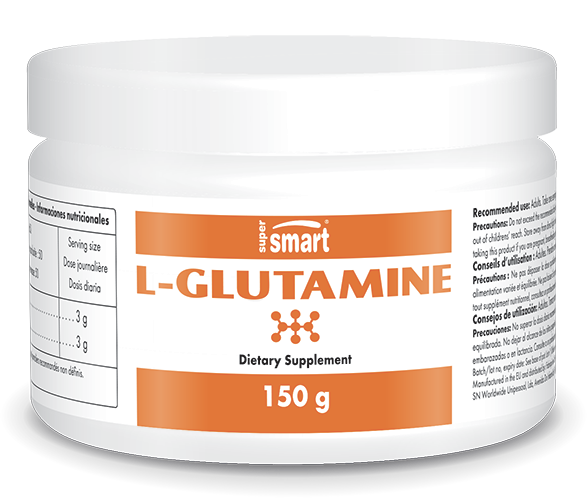 This L-glutamine supplement is very popular with sportspeople. It provides an optimal level of glutamine, one of the 24 proteinogenic amino acids. This means it helps synthesise a number of proteins which are known for their key role in muscle activity. Proteins primarily support the maintenance and renewal of muscle mass, and also help repair micro-lesions in muscles. Glutamine is therefore an amino acid essential for healthy muscle function and muscle mass development. Although the body is able to synthesise glutamine from glutamic acid, certain situations can significantly deplete reserves of this amino acid. A state of extreme stress is one such example, which can be the result of intense sport, physically demanding activity or muscle trauma. Certain everyday stress factors can also contribute to a lack of glutamine. That is why glutamine is considered a conditionally-essential amino acid – in other words, additional intake of glutamine is essential in certain situations, particularly during intense and exhausting physical training. In the situations described above, the body draws on its reserves to support muscle activity and healthy immune function. If these reserves are too low to meet requirements for glutamine, the result can be muscle burnout and compromised immune defences. This can encourage the development of infection, hence the benefits of supplementing with glutamine. Glutamine offers numerous benefits for sportspeople. It helps prevent post-exercise dips in immune defences. It also improves recovery by preventing ‘overtraining syndrome’, the result of too short an interval between training sessions to allow the body to recover properly. Overtraining can manifest as problems with sleep, mood and appetite, amongst others. It also leads to a decrease in sports performance. By promoting post-exercise recovery, glutamine supplementation can thus help improve sports performance. This essential amino acid is available as a nutritional supplement, providing the benefits of glutamine and helping prevent deficiency. Each capsule provides 750mg of L-glutamine, with a suggested dose of four capsules a day, although this can be adapted to individual needs. Studies show that sportspeople obtain good results from taking two grams of L-glutamine following exercise. SuperSmart offers a range of dietary supplements to help boost sports performance, such as extract of Cordyceps Cs-4, which has exceptional effects. Take care of your joints too, with the formulations Tendo-Fix and Joint Support Formula.